You Go Girl! 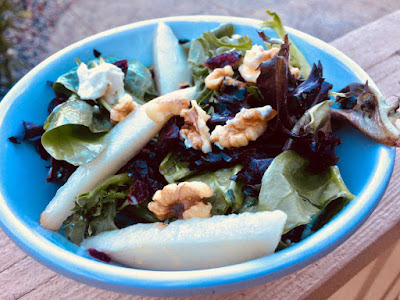 : Pear Walnut Green Salad - yummy! Pear Walnut Green Salad - yummy! My friend Vicki had me over for dinner a while back. Both of our husbands were traveling and she made this quick, easy and yummy salad. She added grilled chicken. It was great with a grilled meat and I have also eaten it as a side dish. In the past, I have not been a huge fan of goat cheese. It was always SO strong. She added goat cheese on the salad and it was really good. The soft texture and flavor was perfect with the pears and the walnuts. She got her goat cheese in a 3 pak at Costco. I just got mine at the local grocery store. You totally need to try this salad this summer.... or anytime! Mixed Greens - I bought the "spring mix"
Just add the desired amount of ingredients and toss with dressing just before serving. It was beneficial to visit Lowcarblab.com as it helped me to find varieties of low carb recipes that are popular these days, so I can make my children happy by cooking some of those recipes.